Big Jellyfish Lake (BJLK) is the deepest of all the "meromictic" marine lakes, i.e. those that are "half-mixed". 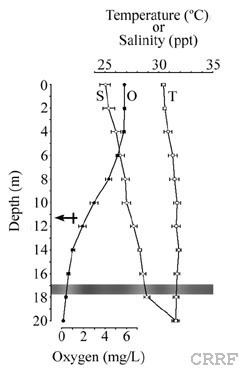 Surface waters are well oxygenated but the lake is anoxic below approximately 18 m (see figure, below), the depth of a well-developed chemocline and dense population of purple-sulfur bacteria. Like Ongeim'l Tketau (OTM), this lake contains golden jellyfish, Mastigias sp., that migrate horizontally each day. However, the migratory behavior of Mastigias in BJLK differs from that in OTM (Hamner & Hauri 1981), suggesting that these populations, evolving in isolation, have adapted to local their environment. Another jellyfish, the moon jellyfish (Aurelia sp.4) also occurs in BJLK (and in OTM). This jellyfish migrates vertically each day, probably following migrations by copepods, which are rich prey. Scyphozoa - Aurelia sp.4, Mastigias sp.